Australia has an enviable Western-style capitalist economy with a per capita GDP on par with the four dominant West European economies. As one of the most developed countries in the world, it has a GNI per capita of US$59,360 and it has seen good GDP growth over the last few years: 2.7% per annum 2008-12. Rising output in the domestic economy, robust business and consumer confidence, and rising exports of raw materials and agricultural products are fuelling the economy. Australia’s emphasis on reforms, low inflation, and growing ties with China are other key factors behind the economy’s strength. The economy was built mainly on farming and mining initially. During World War II manufacturing boomed due to Australia’s geographical isolation. In recent years service industries have come to the fore accounting for 70% of the GDP since 2000. Mining currently contributes up to 10% of the GDP and the island state has some of the world’s largest reserves of lead, nickel, uranium and zinc. The growth of the mining sector has been sustained by the high demand for raw materials from China and other parts of Asia. Australia is home to the largest mining companies in the world BHP Billiton and Rio Tinto, first and third, respectively. BHP Billiton, which is the largest company in the country overall, has a 140-year history in Australia dating back to a silver, lead and zinc mine in Broken Hill in New South Wales. Australia is rich in energy resources with significant petroleum, natural gas, and coal reserves. Petroleum accounts for a large share of energy consumption. Natural gas use is relatively small, but it has been growing rapidly in recent years. The country’s main exports are minerals (aluminium, coal, gold and iron), machinery, cereals, meat and wool. The export of manufactured goods accounts for 30% of exports with goods and services accounting for another 20%. Although the mining sector plays an important role, the Australian economy has been diversified in the last few decades. There has been an expansion in trade with China and Indonesia and the tourism sector has continued to grow. Around 10% of Australia’s GDP is contributed by manufacturing. Despite trade liberalisation and globalisation, in particular the removal of trade barriers and the challenge from China, the manufacturing sector has managed to survive and expand. The processed food and beverage industry is Australia’s largest manufacturing subsector. 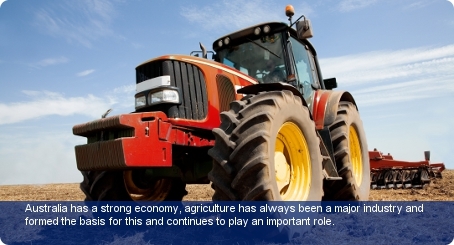 The industry, which employs up to 200,000 people, benefits from forward linkages from the country’s agricultural sector and has been successful in the export market. In the area of heavy industry the country’s success in mining has helped it become a world leader in the development and manufacture of mining equipment, technology and services. Australia’s regulatory environment is more conducive than many other countries to the starting and operation of businesses. It is the second best placed country in the world to start a business and eighth placed for getting access to credit, according to the World Bank’s ‘Doing Business 2012’ study. Australia has a strong economy despite its vulnerability to fluctuating world commodity prices and variations in agricultural output due to drought or other causes. Although one of the world’s strongest economies, the economy is vulnerable to variations in agricultural output and fluctuations in world commodity prices. In 2008-09 the economy slowed due to fall in commodity prices caused by the global downturn. There is a high level of foreign investment, but the Australian government reviews foreign investment proposals against the national interest on a case-by-case basis.